Editor’s note: This feature originally appeared in the March issue of DS News, out now. While digesting the rules, it would be a good idea to find out where those areas are near you and prepare for investments and options for investments there—before the December 31, 2026 deadline. The summary of benefits includes deferred taxes on the investment in an opportunity zone, deferred taxes on income reinvested in opportunity zones, and tax forgiveness on improvements in the value of the building at sale time in opportunity zones—if it is held for 10 years. Studies from the Federal Reserve have shown that Americans were sitting on $6.1 trillion in untapped capital gains at the end of 2017. The option to defer those taxes and reinvest them in opportunity zones until 2026 is one of the goals and benefits of this part of the legislation. With a Qualified Opportunity Zone Fund, which can include partnerships, corporations, and LLCs, there are a variety of static and dynamic methodologies with no required exit until 2047. With these timeframes and sunset windows, it makes for some exciting options for estate planning as well. Key interest is focused on a couple of areas: 1) deferred payment on capital gains taxes, 2) up to 15-point step-down in basis points for capital gains invested for up to eight years, and 3) no tax on the increase in the building if held for 10 years. While headlines focused on the SALT provisions of the Tax Cut and Jobs Act of 2017, an over-looked provision expanded a pilot investment program championed by the Economic Innovation Group think tank, called Opportunity Zones. Interestingly, the pilot had only been in place a few months when the bill passed. The impact may end up sending larger long-term ripples through communities than the SALT provisions. For decades, politicians and local elected officials have struggled over how to address whole areas that are depressed, under-capitalized, and, for the most part, left behind. Programs might nibble at the edges, but local and even state-level funding and support was too little, and often too slow, to overcome the blight. Areas typically gentrified and there was a wholesale change with the loss of community character, and many times a loss of local residents. In contrast, opportunity zones are designed to allow the tax code (through re-invested capital gains profit) to incentivize the market to begin focusing on the structures within those under-funded areas. Additionally, as many cities have suffered from the gap-tooth effect caused by razing blighted properties—and having so many regulations that new development must be heavily subsidized, and was therefore limited by local budgets—new structures may now become financially viable across the whole zone. Under the tax provision, states nominated up to 25 percent of their low-income census tracts as opportunity zones. The IRS ultimately chose the tracts, predominantly based upon statistics. This is where it is important to note that these are not created zones, but the usage of existing zones—specifically, census tracts. In general, these tracts are usually not that large, geographically speaking. They are also not homogenous. Recent articles have mentioned that beachfront tracts in New Jersey and New York, among other areas, don’t have the same level of need by comparison. Those concerns may be valid, but setting a real estate standard across the U.S. will inevitably lead to disparity somewhere. While there will likely be sections of census tracts that do not need improvement that are designated as opportunity zones, those improvements will benefit neighboring properties, and this is not a bad thing. The goal of this effort should not be lost in the hypothetical consideration of how many tax dollars might have been collected, because they haven’t been for years (decades in most cases). Rather, the goal is about focusing patient capital investment on revisiting urban cores across the country for the redevelopment of long-abandoned inner-city communities, as well as the return of businesses, and thereby job opportunities, for those areas. A single, striking point is that most of these opportunity zones lack the business capital necessary to sustain viable workforces, let alone the economic cascade that follows. The Amazon HQ2 facility landing in an opportunity zone will set a goal for which every other one of the 8,700 should strive. Reports are coming in that the Bronx has already seen prices increase 62 percent. Will some speculators who have squatted on properties make money? Very likely. If they want to retain those capital gains or leverage the earnings, they will likely reinvest as well … in an opportunity zone. The IRS determined the 8,700 qualified zones and has shared the information broadly with a list of the census tract numbers—12 percent of the total number of tracts. CREModels.com has an interactive map, and the data provided in GIS formats, for developer convenience to determine if a property is located in a Zone. Why? Because it is essential that the property purchased—after January 1, 2018—is located inside a qualified zone. Without getting into the hair-splitting aspects, if the site is outside the zone, so are the savings and benefits. That could result in a costly tax bill when the IRS catches up, as they always do. The term “substantial improvement” is a key phrase to understand. It means that the building is improved by 100 percent. This means improving a rundown house purchased for $50,000, when the land is excluded from the cost. In something close to a reality check, the cash and cash equivalents were included in as part of the substantial improvement for the first 30 months, to provide time—once the opportunity fund was funded—to close, obtain permits, and execute the appropriate work. An opportunity zone is not a place to hold cash for long periods. A financial plan needs to accompany the development (or, more likely, re-development), and by 31 months, 90 percent of the funds need to have been expended in the improvement of the building. 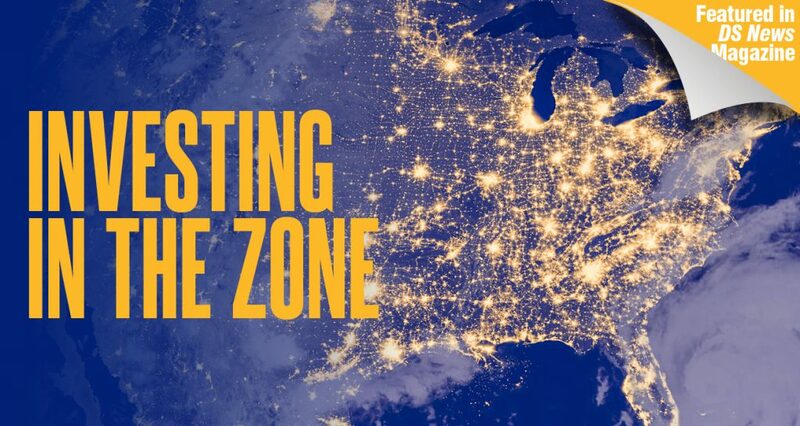 The IRS has offered a great deal of latitude initially by providing that a qualified opportunity zone fund can be self-certified and after six months should be 90 percent invested in the property. For businesses, the threshold is a bit different, in that an opportunity zone business must keep tangible property onsite and have 70 percent of assets in the zone. Adding to the fun, the IRS will allow an opportunity zone fund to invest in both properties and businesses with the 90 percent threshold in place for the fund. The five pages of subchapter 1400Z have raised numerous questions. As of this writing, almost 200 letters have been submitted asking for clarification or relief from some aspect of the language. On October 19, 2018, the first of what will likely be many rule-making proposals was released, and its more than 70 pages raised more questions than it answered. Let’s face it: the idea of the federal government creating a program with minimal oversight and a focus on the market investing capital gains in distressed communities may have made it out of Congress and been signed by President Donald Trump, but the bureaucracy that has to manage it is unprepared, and perhaps unwilling, to have such a hands-off position. A 1031 Exchange, with its extensive limitations of timeframes, intent to sell/ purchase, and restrictions on like-kind properties are thrown to the wind in 1400Z. If you sold a fortune in stock, combined that with profits (and only the profits) from the sale of that corner-highway lot, and rolled it into a qualified opportunity zone fund that was investing in a low-income housing project or a pizza business or small manufacturing plant— or even all three together—that is perfectly fine. If some of the partners want out early? That’s also fine. The others can sell and reinvest, all the while deferring those original capital gains and growing an even larger tax-free nest egg. While the IRS has been leading on this project initially, in December of 2018, President Trump tasked U.S. Department of Housing and Urban Development Secretary Ben Carson with the management and coordination of a Council of 13 federal agencies assisting in the implementation of opportunity zones. Time will tell if the market will be allowed to resuscitate these communities and if local and state leaders will jump on board and prime the pump even more. If that happens, look for qualified opportunity funds to expand in those areas first and avoid areas such as Boulder, Colorado. Boulder passed a moratorium on their only opportunity zone; it was noted as much for political purposes as any other. A recent article on Bloomberg.com cited municipal opposition as “a sad response to a potential bridge to workforce housing that is so desperately needed,” according to Bob Yates, a Boulder City Council Member. “Boulder’s teachers can’t live in Boulder,” he continued. “It’s not a healthy thing to have (a) socioeconomic divide where lower-income people have to live outside of town to serve higher-income people in town.” The opportunity zone could help communities overcome the workforce housing cost obstacles. Missing that chance in order to score political points is a sad commentary and will contrast dramatically with communities and funds that work together with plans that fit. Everyone needs a place to live, but the present state of existence shouldn’t preclude an improved future for the community. There will be plenty of properties available and communities to welcome the investment. Those communities will need to have plans in place and developers had better know the lay of the land, zoning and all, before funding their qualified opportunity zone fund, and its underlying qualified opportunity zone business. Some communities could miss out with the time constraints for development, and developers will likely not have the stomach for long and drawn out negotiations. The investments will move around to one of the neighboring 8,700 census tracts or maybe within the tracts when opposition solidifies. National REIA members tend to improve neighborhoods one home at a time, bringing vacant and distressed housing back online and thereby improving the communities and tax rolls. In opportunity zone communities, investors and developers could all benefit through vibrancy or redevelopment partnered with development, incentivized by this federal program. Finally, the opportunity zones may bring back the option-to-purchase real estate as the most utilized land-securing tool and forgo the long-term land-banking process. Existing land banks will need to be ready for the developments or miss out due to tight time constraints on the fund to invest or reinvest. However, with an initial closing investment window of 2026 and hard exit date of December 2047, investors will be working on opportunity zones for decades.